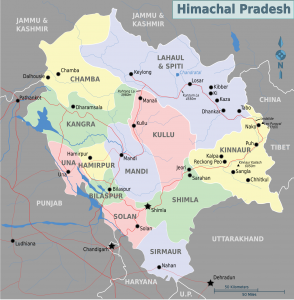 Himachal Pradesh lies in the western Himalayas mountain range. Total area of state is 55,673 square kilometres and a large area lies on foothills of Dhauladhar Range. Reo Purgyil is the highest mountain Peak with a height of 6816 meters. A large number of glaciers and rivers form the drainage system of Himachal Pradesh which provide water to a number of important rivers like Ganga, Indus, Yamuna, Beas, Sutlej, Chenab among others. Due to extreme variations in altitude in different areas, there is a large amount of variation in flora and fauna. Lahaul Spiti, the largest district is mostly a high altitude desert with very little rainfall while others like Dharmshala receive it in plenty.Summer starts from mid-April till June and most parts apart from alpine region experience warm to hot weather. Average temperature may range between 25 to 32 degree celsius. Winters last from last November till March and most of the state above 2200 meters experiences mild to high snowfall. Rainy season brings in lots of rainfall during July month. Road transport is the most popular mode in hilly terrain. The total road network of state is around 28200 km and includes 8 national highways and 19 state highways of 1234 km and 1625 km lengths. Some routes like those leading to Lahaula Spiti stay closed during winter season due to snow. Shimla airport, 21 km from Shimla city. Although most areas of Himachal Pradesh remained somewaht untouched by external customs due to difficult terrain, but with modern advancements, there are rapid changes. Different districts have different languages and some more important ones are Hindi, Pahari, Dogri, Kangri, Kinnauri etc. There are some tribal communities like Gaddis, Gujjars, Lahaulis, Kinnars and majority of population is Hindu. Most of villages have a local deity and song and dance are an intimate part of the religious rituals and local festivals. There are also fairs which are a very popular and provide locals with opportunities to trade, meeting up with friends and have some fun. Himachali handicrafts are very popular and a number of people are involved in making woolen clothes, paintings, woodwork, metal ornaments, shawls and various other things. Some specialties of Himachali cuisines are Madeera, Pateer, Til Chutney, Siddu and Chouck among others. Non-vegetarian diet mostly consists of meat from goat, sheep and chicken and is quite popular. Yak meat is also eaten in certain areas. The cuisine resembles rest of north-Indian cuisines for most part.